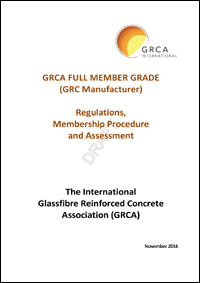 The various Grades of membership of The International Glassfibre Reinforced Concrete Association have different eligibility criteria, acceptance rules for new applicants and ongoing requirements and committments once a person or company has been accepted in to the Association as a Member. The GRC manufacturer Full Member grade of GRCA Membership is available to all existing GRC manufacturing GRCA Member companies worldwide who have succesfully completed at least one year of GRCA membership, and who are manufacturing GRC to a minimum standard of the GRCA's Specification for GRC, GRCA Method of Testing and the GRCA Design Guide. The Full Member grade is subject to an audit by an independent certifying body appointed by the International GRCA to demonstrate that the applicant has sufficient resources in plant, equipment and labour to design and manufacture high quality GRC in accordance with the Full Member regulations. The Full Member application form forms part of the Full Member Regulations document. The GRC Manufacturer grade of GRCA Membership is available all companies worldwide who are manufacturing GRC to a minimum standard of the GRCA's Specification for GRC. Whilst membership is subject to pre-approval by the GRCA Council it should be noted that manufacturing plants are not inspected as part of the application process. It is a requirement of the International GRCA that all GRC manufacturing applicants must complete and submit a GRCA Characteristic Value Spreadsheet containing their last 40 sets of MOR/LOP test results. 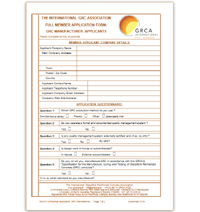 Any company which manufactures GRC products must apply for the GRC Manufacturer grade of GRCA Membership. The GRC Consultants grade of Membership is available to consultant companies worldwide who can include; designers, engineers, and consultants. Any company which manufactures GRC products cannot apply for the GRC Consultants grade of Membership and must apply for the GRC Manufacturer grade of GRCA Membership. The GRC Consultants grade of GRCA Member permits the Member to display the GRCA logo and participate in the running of the Association. The Other GRC Companies grade of GRCA Membership is available to companies who are involved in the GRC industry worldwide. It can include; GRC material suppliers and installers. Any company which manufactures GRC products cannot apply for the Other GRC Companies grade of GRCA Membership and must apply for the GRC Manufacturer grade of GRCA Membership. The Other GRC Companies grade of GRCA Member permits the Member to display the GRCA logo and participate in the running of the Association. GRCA Associate membership is open to anyone with an interest in GRC. This grade is particularly suited to university graduates, academics etc. Often past Officers of the Association who have retired from full time employment will remain as Associates to preserve their interest in GRC and the GRCA. GRCA Associates are not permitted to use the GRCA logo however they may attend meetings of the Association.